New Year, New Trends! 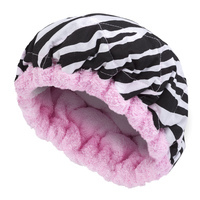 Hot Head is a unique microwavable deep conditioning heat cap created by Sandra Snell, a professional hair stylist. It offers an easy and stylish way to achieve the results of a salon quality conditioning treatment at home. It dramatically improves the results of your favorite deep conditioner, hair masque, oil, or other hair treatment. Without heat, your treatment can only do so much to improve the quality of your hair. Typically, the cuticle is closed, so the treatment is only able to work on the surface of the hair shaft. The results are minimal and superficial when compared to heat enhanced deep conditioning treatments. Hot Head enables the hair cuticle to open for an extended period, allowing the treatment to penetrate the hair shaft, nourishing it from the inside out.